Playing on the Slide -- Let's have it ! Nathan loves the park close to home, where he can play on the slide, a rocking horse on a spring, and a sort of spinning top. 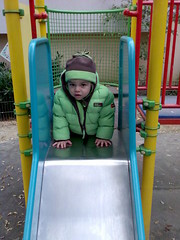 Even now with the colder weather, it’s great to get out and watch him run around and climb up to the top of the slide. I thought the cold colours and his being wrapped up, along with red, yellow, green and blue (primary colours of light & paints together) made it a nice snap. In other news, astronomy has now reached a level of precision where no less than five planets have been discovered in another solar system around 55 Cancri. One of them is in the habitable zone – a planet that could be a twin of Earth. China have successfully launched their lunar probe and it has already successfully positioned itself to orbit the moon. A few more maneuvers are needed before it is in fully operational orbit. I think it’s a fascinating time, with space exploration back in the news and lunar landings likely to happen in the next ten to fifteen years. Nathan might live a childhood full of awe of space and thoughts of other worlds, a bit like growing up in the sixties? This entry was posted on Tuesday, November 6th, 2007 at 10:48 pm and is filed under baby, general, photography, science. You can follow any responses to this entry through the RSS 2.0 feed. Both comments and pings are currently closed. An Irishman goes up to bed every night taking a full glass of water and an empty glass with him .Why? Because some nights he is thirsty, and some nights he isn't.